[Austen Ivereigh] In his first General Audience for a month, Pope Francis today stressed the importance of including and welcoming Catholics who have divorced and entered a second union, making clear that they are “by no means excommunicated”. Although such second unions “are contrary to the Sacrament of marriage”, he said that the Church “seeks the good and salvation of all her children”, adding that it was urgent “to foster a true welcome for these families in our communities”, not least because such situations “especially affect children”. “If then we look at these new bonds also with the eyes of small children … with the eyes of children, we see again the urgency to grow in our communities a real welcoming towards people that live in such situations,” Francis said in the Vatican’s Paul VI Hall. In remarks added to the official text of his catechesis (see CNS), he asked: “How can we recommend to these parents to do all [they can] to educate their children in the Christian life, giving them the example of a sure and practiced faith, if we put them at a distance from the life of the community, as if they might have been excommunicated?” the Pope asked. Today’s catechesis is part of a series of teachings on the family at the Pope’s weekday audiences in the lead-up to the Synod on the family in October, in which the Church’s attitudes and behavior towards the remarried — who often assume they are not welcome any more in parishes, because they are unable to receive the sacraments of Confession and the Eucharist — are a subject of intense debate. 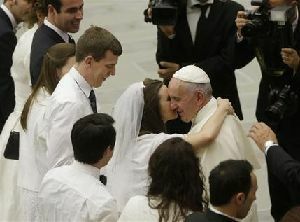 Although there will be no change in the Church’s commitment to indissolubility of marriage, which is reflected in the rules over receiving the sacraments, Pope Francis is keen for the synod to come up with ways of overcoming the cycle of exclusion. Some synod delegates will favor allowing some couples to be readmitted under strict conditions, while others will resist any attempts that they believe will weaken the witness to indissolubility. Bishops at previous synods have often pointed out the way in which the transmission of faith through the family is becoming far harder because of the numbers of parents separating and remarrying. Not only do they drift away from the Church, but their children do too, thus reversing the natural cycle of evangelization, in which faith is passed down through the generations. Francis noted how, under his predecessors, the Church has been keen to find ways of offering pastoral care to the divorced and civilly remarried. This entry was posted in marriage, Pope Francis, Synod2014, Synod2015. Bookmark the permalink.